Welcome MyPlate (Thali), Goodbye MyPyramid! Surgeon General Regina Benjamin unveiled a new icon to complement the 2010 Dietary Guidelines for Americans . The new symbol for healthy eating called MyPlate will help consumers make better food choices and will replace the food pyramid. This means the plate (thali) is in and the MyPyramid is out! Let’s take a look at the new MyPlate design and compare it with a traditional home-cooked Indian thali. A Thali (Hindi: थाली, meaning “plate”; IPA: [tʰɑːliː] ) refers to an arrangement of food in a round plate (with bowls) or a tray with multiple compartments that has all the food groups in just the right proportions. have a cup of yogurt each day. A typical traditional home-made Indian thali is nutritionally balanced and a colorful meal. 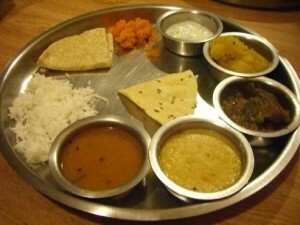 Regardless of regional variances, the thali has the perfect combination of the five food groups, offers variety of textures, and encompasses all the six characteristic tastes – astringent such as beans, cabbage, apple; bitter such as spinach and kale; pungent such as ginger, chili peppers; sweet such as rice, pasta, sugar, cream; sour such as lemon, vinegar, yogurt; and salty, anything to which salt is added. The spices added to food not only add flavor to the meal but research shows that they are a source of antioxidants, phytochemicals and essential oils. Living in the age of Reality TV, apps, iPhones and Facebook, we have forgotten the importance of having a wholesome and peaceful meals. 7. Desert – carrot halwa/ fruit salad. Our ancestors on the Indian sub-continent have been using the “Plate Method” for thousands of years to inherently incorporate a daily nutritionally balanced meal without requiring externally enforced guidelines. 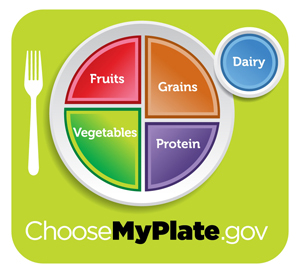 We have gone a full circle and the MyPlate guidelines that the USDA has launched looks so very promising !